Yes yes, one day - maybe, just maybe - I will post a Musical Monday every Monday. Wouldn't that be something. I'm tempted to do a few at a time, and just schedule them to post, but with people whining on YouTube that "But That's MY Song!" there is the high-likelihood of the video not being available once it comes around to posting. This is a song I often think about posting as my Musical Monday, but for some reason, I always forget to post it. 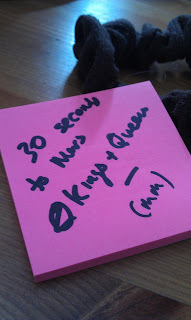 The only reason I remembered today was due to me editing meta-data on parts of my MP3 collection (the songs that didn't conform to my anally-retentive mentalness) and I even wrote it down on a post-it note so I remembered! Yes, my post-its are pink. So aside from many random tangents... The song. Yes. Since then, I've heard it and thought "Oooh!" and then forgotten it, then eventually gotten ahold of it, then proceeded to resume forgetting about it - until I hear it again and think "Oooh!" once more. But not today. No no no!